I enjoy inventing, devising and designing. By your comments I see that many of you have made versions of Tilta Swift, and some have even made a Power Outage Yarn Swift. At one point I designed quilt patterns, including a tessellating Y-Knot based on a Chinese lattice pattern. I devised a quilt pattern drafting tool, GridSource, and sold about 1000 of them worldwide before the advent of the personal computer ate GridSource's lunch. I learned how to create websites when websites were new, and spent a few years creating mathematical quilts to add to my personal site, mathquilt.com. If you toured mathquilt.com and happened to follow the QED (Quilts Every Day) link on the first day of any month, you would see my Mobius Quilt. In the mid-1980s I made a few Mobius scarves, based on Elizabeth Zimmerman's directions in Vogue Knitting. In fact, I've long had a fascination with Mobius strips, a.k.a. 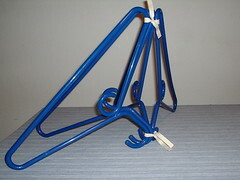 Mobius loops. Perhaps all this background really does make my next step inevitable, although I must say I was surprised when it happened: I invented the Mobius bow tie. And by invented, I mean that I have applied for a patent. The fact that I have applied for a patent means that while my application undergoes examination, I am allowed to use the term "patent pending" on my labels. 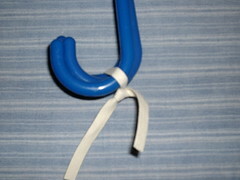 On National Bow Tie Day on August 28, I began to tweet photos of Mobius bow ties. I hope to launch a dedicated web site in the next few weeks. 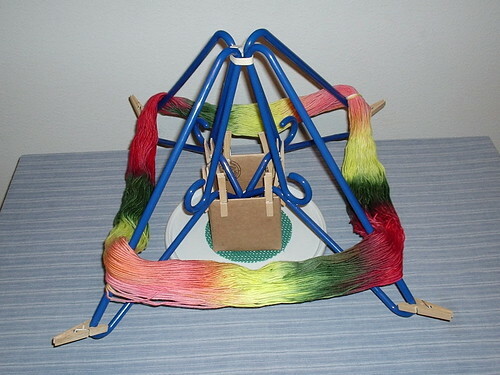 The Power Outage Yarn Swift is cheap and fast to make. It's glued, not drilled, so no power tools are needed. 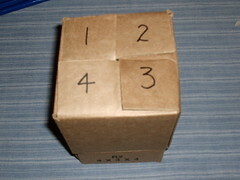 You have the option of making the portable, storable two-piece Parts-is-Parts version (using Original Step 5), or the one-piece Space Hog version (using Alternate Step 5). You can make it in an evening, power outage or no, and use it the next day. 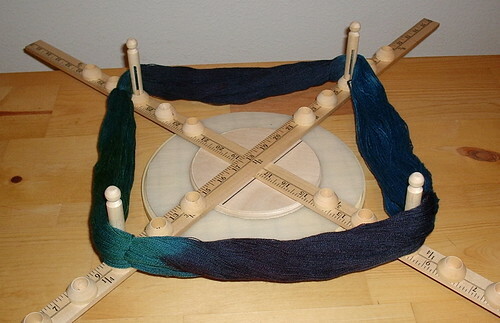 The Power Outage Yarn Swift is adjustable for skein sizes of 23” (with doll pins at 14” and 22”) up to about 68” (with doll pins at 6” and 30”). 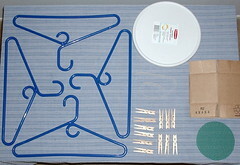 If you regularly use skeins outside these dimensions, you might want to customize the location of the doll pin stands in Step 2. 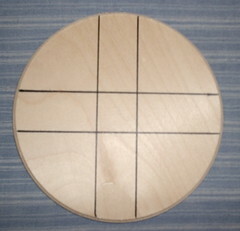 Step 1: Make alignment marks on the wooden circle plaque. 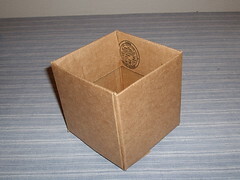 Using the pencil and a yardstick, mark a centered cross on the top of the wooden circle plaque, the width of the yardstick. 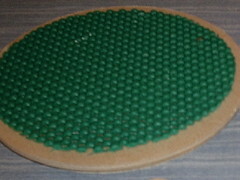 Glue the gripper pad to the back of the wooden circle plaque (not needed if you use Alternate Step 5). Step 2: Glue the doll pin stands to the yardsticks. 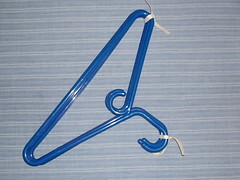 Glue the doll pin stands at 6, 8, 10, 12, 14, and 22, 24, 26, 28, and 30 inches. 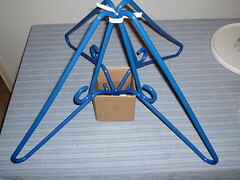 Neatness counts, so glue without getting glue slop in the middle of the doll pin stands. Let dry. Step 3: Glue the two yardsticks together at a right angle. 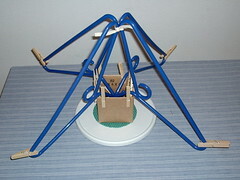 Put glue on the 18” position on the first yardstick, and place the 18” position of the second yardstick directly on top. 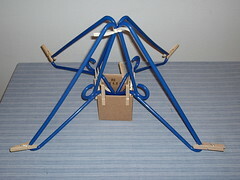 The two yardsticks are centered and at right angles, and the doll pin stands all face up. 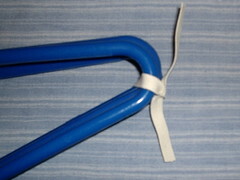 Clamp with the C-clamp, and let dry. Step 4: Glue the wooden circle plaque to the yardsticks. Put glue on the wooden circle plaque from edge to edge inside the penciled cross marking, but only in one direction. (Only one yardstick touches the wooden circle plaque, so don't glue all over the place.) 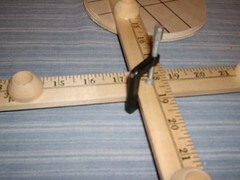 Press the yardsticks into the glue, using the markings to center both yardsticks. 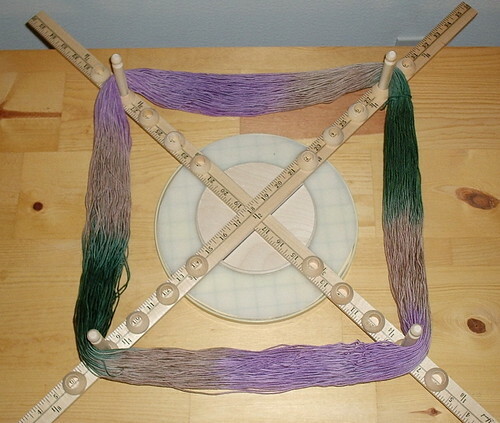 Place some small, heavy object on the middle of the yardstick assembly, without shifting the position, and let dry. Alternate Step 5: Assemble with attitude. For the Space Hog version, skip the gripper pad, and just glue the yardstick assembly to the top center of the Lazy Susan. Let dry. 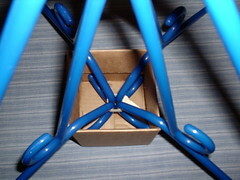 Step 6: Pin. 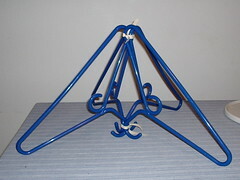 Place four doll pins in doll pin stands, to match the size of your skein of yarn. 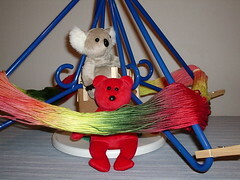 The first picture shows a 60” skein, with doll pins at 8” and 28”. 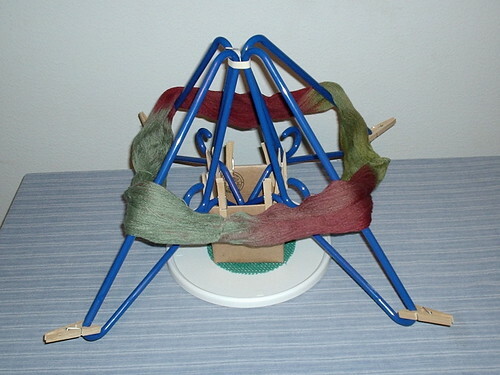 The second picture shows a 46” skein, with doll pins at 10” and 26”. 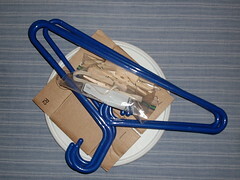 You can store the two-piece Parts-is-Parts version by hanging up the yardstick assembly using the hole that's already in the end of the yardstick. Add the decorated doll pins from Optional Step 7, and call it Aht, Dahling.